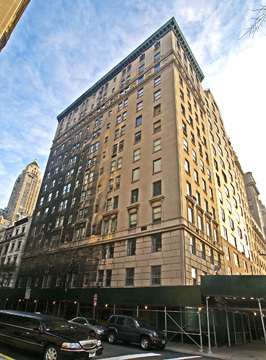 This is one of the most impressive smaller luxury apartment buildings on Fifth Avenue. Erected in 1926, the 15-story, limestone-clad structure was converted to a cooperative in 1956 and has 25 apartments. Designed in Italian-Renaissance-palazzo style, the building has a very elegant, canopied entrance with attractive bronze doors. The building was originally designed by I. N. Phelps Stokes as an 8-story building because the city had recently changed its zoning for the area to limit buildings to a height of only 75 feet. This finely detailed building has an unusual and interesting "bird-cage" rooftop watertank enclosure, shown above. It also has very nice sidewalk landscaping. The citys first Zoning Resolution, enacted in 1916, permitted buildings to rise 150 feet along Central Park on the avenue, by in 1920 the Real Estate Board of New York, the City Club and the Fifth Avenue Association successfully campaigned to lower that height limit to 75 feet. "Many property owners viewed this portion of the zoning law as an unwelcome invitation to real estate speculation and chaotic physical change," noted Robert A. M. Stern, Gregory Gilmartin and Thomas Mellins in their important book, "New York 1930, Architecture and Humanism Between The Two World Wars," Rizzoli International Publications, Inc., (1987). "An amendment to that effect was enacted in November 1921, only to be immediately challenged by other landholders and real estate speculators, including Vincent Astor, as well as by J. E. R. Carpenter, who had begun to serve not only as an architect but also as a developer of apartment houses. In 1923 the decision of the Appellate Division of the Supreme Court of New York to overturn the seventy-five-foot restriction and return to the 150-foot limit was upheld by the Court of Appeals, clearing the way for the nearly complete reconstruction of Fifth Avenues park blocks, a reconstruction that would begin barely ten years after the completion of the last great mansion, Delano & Aldrichs house for Willard Straight of 1914 [on the northeast corner at 94th Street]....Only one apartment house was built under the seventy-five foot restriction: Henry Otis Chapmans 952 Fifth Avenue of 1923, which rose only eight stories on a previously vacant site." The change in zoning back to the 150-foot limit led the developers of 956 Fifth Avenue to hire Nathan Korn to redesign the building and add six more stories. Korn was the architect also of 944 Fifth Avenue (see The City Review article). This buildings site was once occupied, according to Jerry E. Patterson in his book, "Fifth Avenue, The Best Address," (Rizzoli International Publications, 1998), by a very large, domed building with a broad front flight of stairs designed by William Arnold Brunner and Thomas Tryon in 1899 for Temple Beth-El, which eventually merged with Temple Emanu-el, which is located on the northeast corner of 65th Street and Fifth Avenue. This is one of the most desirable areas of Fifth Avenue because it is beside one of the loveliest sections of Central Park and is removed from the heavy cross-town traffic. It is close to major museums and the art galleries and fashion boutiques of Madison Avenue. In 1974, the rear apartment on the top floor, a two-bedroom unit, was on the market for $60,000.